By the way, I will be presenting “Owning the Network: Adventures in Router Rootkits” this Sunday, 12 noon at DEF CON 20. If you enjoy ownage, networks, adventures, routers, and rootkits, this talk is for you. I’ll be releasing my firmware generation/manipulation framework at the talk, which will be made available on the site shortly afterwards. Slides and (hopefully) video will be available as well. For the past 8 months or so, I’ve been heading a project on reverse engineering router firmware with the end goal of developing a generalized, repeatable, effective technique to backdoor router firmwares images (and ultimately the devices they are flashed upon). While I have much to share about my research and progress so far, it is unfortunately not the topic of this post, but will instead have to wait until a future one. While waiting for potential replies on the reverse engineering route, I additionally reached out to NETGEAR itself to see if it would be possible for them to simply provide their version of the unsquashfs code. As this utility is not necessary for the actual firmware build process, I was wholly expecting an answer of either “I’m sorry, we have no such tool” or “We simply are unable to send it to you,” but figured it was worth a try anyways. However, I was a bit surprised to instead receive the answer that apparently the WNR1000v3 is actually not open source. unpackage the filesystem on this router? Thank you! I understand that you want to modify the source code of the router. assured that we will do our best to resolve your case quickly. the source code of this router because its not an open source. Thanks again for choosing NETGEAR. Have a great day! the NETGEAR GearHead services, go to http://kbserver.netgear.com/kb_web_files/gearhead/home.html. I have replied to the ticket and will provide updates as the conversation progresses. that is part of the SquashFS project. software project used to build this router''s filesystem? Thank you. My name is Naveen, and I am following up on your Support case. On November 29, 2011, Luigi Auriemma published a security advisory containing multiple vulnerabilities in the 3S CoDeSys Automation Suite. Like much of the other software Auriemma has researched in past months, CoDeSys is SCADA software. For those who aren’t familiar with the term, SCADA stands for “Supervisory Control and Data Acquisition,” which is just a fancy way of saying “the code that runs big machines, assembly lines, and the utilities we rely on every day (water, electricity, etc. ).” To put it more bluntly, things that should never fail and should never be messed with. SCADA applications and appliances have been receiving a lot of media attention lately for all the security problems they’re causing, most infamously being the root of the Stuxnet outbreak in 2010. If you spend more than a few minutes looking at the applications that power our infrastructure and the systems they run on, you’ll realize it’s time to get a little nervous. Much of this software is full of bugs, poorly maintained by the vendors, and has the look and feel of the Windows 2000 era. I intend to publish a three-part series of blog posts detailing my experience weaponizing Auriemma’s CoDeSys advisory, turning simple DoS into remote code execution. It is meant to be a learning experience, and hopefully it will help others in writing their own exploits as I explain the steps taken to circumvent the different exploit mitigations implemented in the software. A minimal amount of experience with memory corruption but a fair amount of intuition will be necessary to follow along. While I will introduce concepts as they appear, I will not explain every little detail for the sake of fluency and brevity. CoDeSysControlService for handling the HTTP connections on port 8080. For this post we’ll be exploiting CoDeSys V3.4 SP4 Patch 2 on Windows XP Professional SP3. While this is not the most up-to-date version of the OS, it has been chosen for various reasons, most prominently due to the fact that DEP is enabled but ASLR is not implemented. This is a good point to start at both technically and conceptually — Don’t worry, ASLR will play a major role towards the end of this series. Interestingly enough, it appears we found a (functionality) bug in Immunity if you take a look at the memcpy() call frame on the stack. In actuality we’re copying to dest=0x02cdfb44 from src=0x00399dc8 a total of n=0x1ff4=8180 bytes. 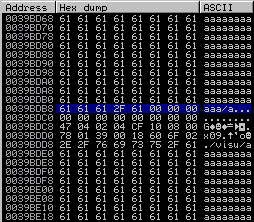 Scrolling down a bit in the dump window we see our crafted URL string in memory in its entirety, staged to be memcpy()’d somewhere on the stack. Continuing execution, we hit the same write exception as the first run through. Our first challenge will be getting around this issue before we’ll be able to continue. The first step will be to look at the call stack, which will play two important roles in our debugging effort. 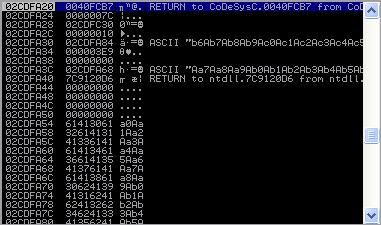 First, if you notice the third function on the stack, we corrupted the return pointer with 0x61616161, or “aaaa”. This confirms that we have in fact overflowed a buffer and now control some function’s call frame. The ultimate goal will be navigating through the rest of the code until we are able to return from this function, gaining control over EIP and eventually executing our payload. The second role, one more relevant to the current situation, is determining which function was last called before the exception. Looking at the top of the call stack, we see that it crashed somewhere within the function called from 0x0040f5d4… the same memcpy() that we looked at earlier! If you read the exception message carefully, the program crashed due to an inability to write to the address 0x02ce0000, which just so happens to be the bottom of the stack. Our overflow string was so long that we tried writing past the stack itself! This would be a good time to start writing our exploit script – let’s shorten the overflow string and try again. Progress! Looks like we’re now reaching an exception reading a pointer we control. If we find the exact offset in our buffer this pointer is being derived from and replace it with a pointer to readable memory, we should be able to get past this part as well. In order to pinpoint exactly where this pointer resides in our buffer, we’ll call upon the great mona.py to generate a cyclic pattern. By replacing our overflow string with a cyclic pattern, the pointer will be replaced with a unique four-byte sequence, which we’ll then be able to trace to a specific offset in the string. What’s this? Process terminated? Not just ended, but terminated? What would cause such a thing? Let’s go back and add a bunch of breakpoints and see where it terminates. We’ll follow the execution step-by-step and determine exactly the root cause of this. Uh oh… It looks like we’ve been plagued with stack cookies. No matter how delicious they sound, these are not the type of cookies you want. When we overwrote the call frame for the current function, we corrupted the cookie on the stack before it. We won’t be able to do a direct ret overwrite, so we’ll have to get crafty and influence the program in other ways to circumvent the memory protection. This doesn’t technically mean the end of an SEH overwrite possibility, as there are other techniques such as generating gadgets from bytes outside of loaded modules in memory, but before we go crazy let’s see what else we have to work with. Next post in this series (the second of three) we’ll look at how to turn EIP into arbitrary code execution, bypassing DEP and spawning a shell on the remote host. I received a Samsung Infuse 4G this year for Christmas, and one of the first questions I had was how to let this bad boy run free. Doing a little searching around, it looked like the device was already rootable by the RageAgainstTheCage exploit by the Android Exploid Crew, but of course using an already-written, pre-compiled exploit is too boring. Note, before we even begin, the device should be placed into USB debugging mode so we can interact with it from a shell (via the ADB – Android Debug Bridge). Running `su` in the adb shell, as well as apps for rooted phones, will now prompt the user (on the phone itself) to grant root privileges to the process. This selection can be remembered for future use. A one-click root script for Linux is available here: https://github.com/mncoppola/Infuse-4G-root. If this exploit works for other phones, contact me and I’ll update the post. Thanks to Dan Rosenberg for his tips and guidance throughout the process.